Social Media Crackdown: The New Normal for Africa? People hold placards reading "Free Rasbath," referring to Mohamed Youssouf Bathily, a young radio presenter also known as "Rasbath," who was arrested, as they take part in a demonstration in front of Bamako's court in Mali, Aug. 17, 2016. Mali blocked social media after the arrest and the violent protests that followed. Police in Burundi arrested eight people Saturday for allegedly circulating defamatory anti-government statements on social media. The Burundi case is not unique. The list of African countries trying to cut or control social media keeps growing, particularly during elections or periods of unrest. In Ethiopia, no stranger to restrictions on press freedom, authorities began periodically shutting down access to social media in the Oromia region in March as a response to ongoing protests. In July, Ethiopia blocked social media after university entrance exams were leaked online. FILE - Ethiopian demonstrators held a rally in front of the White House criticizing president Barack Obama’s trip to Ethiopia, a country they say has terrible press freedom records. Zimbabwe has used a 2002 law against insulting the president to arrest people for statements made online. Since July, anti-government activists in Zimbabwe have been using the hashtags #ThisFlag and #Tajamuka to mobilize for demonstrations. The government has branded them as "cyberterrorists" and drafted new legislation to limit such activity. Angola created the "Angolan Social Communications Regulatory Body," run by the ruling party, to ensure adherence to new media laws. Meanwhile, across the continent, Mali blocked social media in Bamako this month following the arrest of a popular radio journalist, which led to violent protests that reportedly left several people dead. Those are just a few recent examples. Other countries may be taking a subtler approach, according to Henry Maina, East Africa director for Article 19, an organization that advocates for freedom of expression. FILE - Journalists with tape on their mouths gather on the occasion of World Press Freedom Day, Bujumbura, Burundi, May 3, 2015. "Do not rule out situations where Kenya uses filtering,” he said, “so you have cases of internet slowdown totally, where during certain periods, during our election period in 2013 or during the Garissa terrorist attack, when you just notice that the internet is slower. And that's a different system of just interference, even though it's not as bad as shutdowns." Adjoa Anyimadu, an Africa research associate at London-based Chatham House, says that these crackdowns affect specific segments of the population. "It is still a situation where internet penetration is relatively low in Africa, across Africa, so you have to kind of think about the kinds of people who are most engaged in social media in a lot of these countries," Anyimadu said. "In a lot of these places, it's the middle class and it's the younger parts of the population." Uganda blocked access to social media platforms during its February elections, and then again for the inauguration of its longtime president Yoweri Museveni. 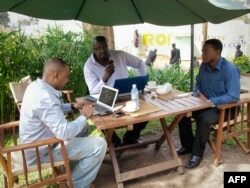 But many Ugandans were able to get around it with VPN, or virtual private network software. John Mbaku, a non-resident senior fellow at the Washington-based Brookings Institution, argues that restricting social media can backfire. "I think that cracking down on social media is not a very good way to run a country," Mbaku said. "And part of the reason has to be that in most African countries, people have very few avenues to express themselves, especially if they are dissatisfied with the government. “It is important that government give people an opportunity to be able to express themselves so that they wouldn't be frustrated with the government for one thing or another, and would not end up resorting to violence as a way to express themselves," he added. Governments are also believed to be doing more surveillance of mobile and internet communications, couched in national security laws. "With increased terrorism, many governments in Africa have come up with new laws to help them fight terrorism," Mbaku said. "Part of the problem we are seeing now is that some of these governments, not all of them, but some of them, are using those anti-terrorism laws to spy on citizens and gather information that doesn't really help them fight terrorism, but helps them control the population so that they can continue to perpetrate themselves in government indefinitely." FILE - Men work on their laptops at the Endiro Cade in Kampala, Uganda. In a report last year, Privacy International detailed the use of spyware by police and military in Uganda to covertly monitor "leading opposition members, activists, elected officials, intelligence insiders and journalists following the 2011 election." The government denied the allegations and refused to open a parliamentary investigation into the matter. A recent Associated Press report highlighted increased surveillance in South Sudan, noting an interview with a jailed activist who said his interrogators "played recordings of him in intercepted phone conversations and showed him emails he had sent." A government spokesman declined to discuss the issue. Anyimadu says efforts to stop dissent online may ultimately prove futile. "The unique thing about technology and social media is that it's constantly evolving, and I'm sure that as ways of shutting down social media evolve, so will ways of getting around those kinds of shutdowns," Anyimadu said. According to the International Telecommunication Union, just 9.5 percent of the 940 million people living in the world's least developed countries use the internet. But things are changing fast in Africa. The number of smartphone connections on the continent has doubled in the past two years, according to a 2016 report by GSMA Intelligence, which specializes in global mobile operator analysis. And mobile broadband connections are expected to triple from 2015 to 2020.